Particularly: Add specific Bingo Battle locations. Find out how long it takes for the plant stubs to grow fully. Pellet Posies (ペレット草?, lit. : "Pellet Grass") are a species of plant that appear in all Pikmin games. They possess a unique trait which allows them to crystallize their nectar into pellets, which are dropped when the plant is broken down by a Pikmin. Pikmin can be ordered to carry these back to their Onions, and they are the main way Pikmin propagate. The pellets come in different sizes (1, 5, 10, and 20) and colors (matching the colors of the Onions). These differences determine the number of Pikmin produced when the pellet is collected. Some Posies' pellets change color at regular intervals, in a similar way to Queen Candypop Buds; the color is fixed when the Posy is destroyed, making it possible for the player to choose which to collect. The order that the color cycles is always the chronological order that the Pikmin are discovered. In Pikmin and Pikmin 2, this cycle goes red, yellow, blue. In Pikmin 3, the order is red, gray, yellow, pink, blue. Using glitches or sequence breaks to discover Onions in a different order in any game has no effect on the cycles. After a pellet posy is taken down, it disappears, but returns the next day as a small stub, which grows over time. They take four minutes to grow to full height and generate a new pellet, in Pikmin. In Pikmin 2, all Posies have the same size and health, but in Pikmin 3, larger pellets need larger Pellet Posies, which in turn have more health. In Pikmin, Pikmin that are thrown at a Pellet Posy will knock it out, but return to the leader right away, if he's still nearby. In the Wii remake, the Pikmin stay idle after taking down the pellet, which leads to them carrying the object automatically. Different kinds of Pellet Posies in the Awakening Wood. Not pictured is a 5 pellet Pellet Posy, nor the posy that belonged to the now fallen 20 pellet. Pellet Posies are rather common in the first Pikmin game, especially at The Impact Site. Although there are 5-, 10-, and 20-weight pellets, Posies which actually grow these are not found in Pikmin. Pellet Posies are also absent from The Final Trial. In Pikmin 2, Pellet Posies appear regularly in the Valley of Repose and the Awakening Wood, but disappear from the Perplexing Pool the day after Yellow Pikmin are discovered, and are never found in the Wistful Wild. However, pellets without a plant can be found within all above-ground areas, usually as a drop from enemies. Neither pellets nor Pellet Posies are ever found in caves. 10-weight Pellet Posies are rare: there is one in the Valley of Repose, which changes colors and can be found on a ledge in the vicinity of the Hocotate ship, starting on day 4. In the Awakening Wood, there are three, located to the left of the landing site, near the location of the Pilgrim Bulb. The yellow one is near one of the Burgeoning Spiderworts, located on a ledge, ideal for the use of Yellow Pikmin to attack and retrieve the pellet, and the other two (red and blue) are at ground level. The only 20-weight pellet in the game is also in the Awakening Wood, situated on the ledge that is left around from where the Sunseed Berry is found. This pellet intermittently changes color, so careful timing is needed when cutting it down to get the desired color of pellet. It appears starting on day 11, and respawns five days after being collected. Pellet Posies are found in every area except the Formidable Oak, scattered around. In order to help grow newly found Pikmin, Pellet Posies that are always the color of that Pikmin type are found near the discovery site of each Onion, except for Rock Pikmin (where the pellets are encased in crystal). The days after an Onion is found, its respective Pellet Posies disappear, with the exception of the Blue Onion and the Winged Onion. Suggestions: Add a strategy to help with timing a throw to get the pellet you want. Although the Pellet Posy is classified as a plant rather than an enemy, it is still vulnerable to attacks and can be killed with ease by Pikmin or a leader. When hit, they make a "squeaking" sound. For an instant kill, throw your Pikmin at the pellet, not the stem. There are exceptions to this quick knockout: Posies larger than size "1" in Pikmin 3 will need to have Pikmin thrown on to it, so they can latch on and gradually detach it with attacks. Winged Pikmin can knock down the pellets right away, but only with specific aim or by throwing them from below, otherwise the Pikmin will just fly to the pellet, latch on, and pummel it, like if it were a bigger pellet. The noise Pellet Posies make when hit, in Pikmin and Pikmin 2. Pellet Posies also appear in the "Distant Planet" stage in the Super Smash Bros. games with similar purposes; hitting them causes them to drop their pellets, which can be thrown at opponents. Different number pellets do different amounts of damage. They can also be thrown into an Onion that appears periodically, which will then eject items, if they are on. Higher numbers and matching colors equal more items. 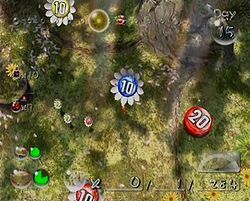 A red Pellet Posy appears as a sticker in Brawl, although it is called "Red Pellet Flower". A posy is a bouquet of flowers in the real world, and the Pellet Posy is named such because it is a flower, but has a pellet in the center. In Japan, this plant is called ペレット草?, which simply translates to "Pellet Grass". Its scientific name is Amplus nutrio, which is Latin for "ample nutrients", due to the pellets it generates being a great resource for Pikmin. In Pikmin, the plant is internally known as palm, perhaps alluring to palm trees, but is simply called pelplant in Pikmin 2 and Pikmin 3, which is short for "pellet plant". Spanish (NoA) Pildiflora Portmanteau of "pildora" (pill) and "flora"
Portuguese (NoE) Flor de Comprimidos Pill Flower Translation taken from the Pikmin instruction manual. Artwork of a red, a yellow, and a blue Pellet Posy. A Pellet Posy in the enemy reel. Artwork of a Pellet Posy with a 5 blue pellet. Artwork of a Pellet Posy from New Play Control! Pikmin 2. Artwork of three Pellet Posies with 10 pellets. 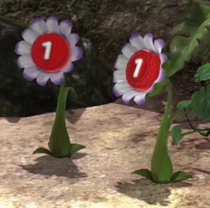 A screenshot of 3 red Pellet Posies in Pikmin 2. A Pellet Posy sporting a 5 pellet in Pikmin 2. Two "1" Pellet Posies on the Piklopedia. A gray Pellet Posy in Pikmin 3, with a White Spectralid on top. A Pellet Posy before growing, in Pikmin 3. The first stage of development of a Pellet Posy. The second stage of development of a Pellet Posy. The data file on the Pellet Posy. A Pellet Posy in Super Smash Bros. Brawl. Card of a Pellet Posy with a yellow pellet. Card of a Pellet Posy with a blue pellet. Card of a Pellet Posy with a red pellet. Early models of Pellet Posies in Pikmin have spiky stems, and when killed, instead of the petals falling off and the pellet falling flat on its back, the pellets remain sideways and the petals disappear in purple lights. With a glitch in Pikmin 2, it is possible for a Pellet Posy to stay alive with 0 health. This depends on the number of hits a Pikmin dealt after latching on to it. This page was last edited on April 4, 2019, at 16:34.